I fished Whitetop Laurel on Friday, hoping to catch a bunch of trout and to bring a few home for a fish fry as well. I started the day fishing the 12" minnimum stretch right above the stocked portion at the creek junction. I didn't get any 12" plus wild browns that I was looking for, although I missed a solid 13" fish that caught me off guard in pocket water. I fished a #8 gold flash clouser with my TFO 3/4 weight, using a 10 foot leader because there are some very deep pools and I have floating line. I ended up landing 6 rainbows in the special regulation area, all 9-11 inch "stockers" with the exception of one 6" beautiful wild rainbow. I fished a few nymphs and a black wooly bugger but the fish would only take the flash clouser. My brother Wyatt and I fished the stocked portion immediately below the special reg stretch and caught a good number of stocker rainbows, keeping 3 of them, and we released a 10" wild brown. We headed to the lower stocked section below where the creek bends away from the road, and caught a very solid number of fish there. I traded my fly rod for my ultralight with a trout magnet because there is a LOT of water moving through that portion of river and it is hard for me to enjoy dragging a nymph through a 5 foot hole with 3 split shot above it. I ended up catching my limit, including the gorgeous 12" wild brown I had been holding out for all day, and a suprise 11" wild rainbow. I mostly caught 9-12 inch stockers, with one being a chunky 13 inch male. The stream hadn't been stocked for 6 weeks though, so they were behaving like wild fish, and their meat color showed they had been there for a while. After I kept my limit of fish, I worked with my little brother Ewing for about an hour, trying to help him catch a couple trout, he had struggled with them all day and had only managed a couple trout. This was only the 2nd time he had fished the stream so the techniques we use on the freshly stocked C'ville trout did not work. 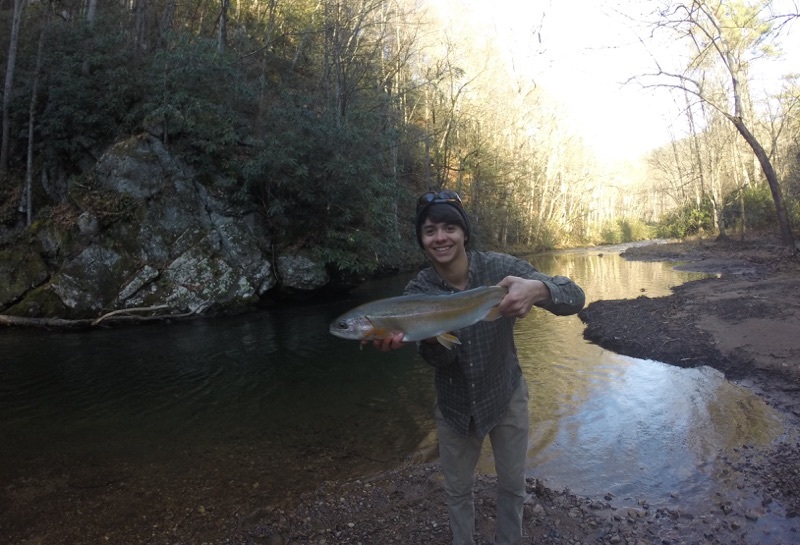 He had a few takes and finally he landed a nice 12" stocked rainbow in about 5 feet of water between two pilings under a train tressel (now a Virginia Creeper Trail tressel). We ended the day with 17 trout kept, and many others released. I caught 15 trout total, 6 on the fly rod. I encourage anyone who has the opportunity to try out Whitetop Laurel if they get a chance, or any of the creeks in that area, Tennesee Laurel, Green Cove Creek, Beaverdam Creek, or just any decent sized creek running beside the road in the area, they all hold trout. Thanks for reading! Wyatt with a gorgeous 11" wild brookie caught in our 15 minute scouting trip prior to the fishing day. In all of our years fishing Whitetop, we have only landed 3 brookies, this being the largest by far.